I'm writing this from a pub in Vauxhall while a man from the BBC points a camera at me. Happily, he does not appear to be dangerous in any way. So that's set the scene. I've just witnessed the launch of a poster campaign to encourage Londoners to vote and by doing so prevent the British National Party securing a seat on the London Assembly. It was both novel and heartening to see the principal candidates for mayor being nice to each other in a public place and in a good cause. I told myself to savour these moments, for I may never experience their like again. 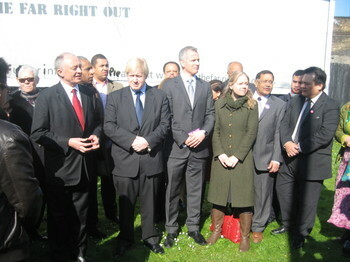 The organisers were Operation Black Vote, a non-partisan organisation devoted to encouraging BME participation in politics and the electoral process. Ken Livingstone, Boris Johnson, Brian Paddick and Sian Berry were all there, as were various candidates for the Assembly, including Lib Dem Meral Ece and Conservative James Cleverly. Suitably for such an ecumenical occasion various faith group leaders were also in attendance, including the Reverend Andrew Wakefield and a prominent Muslim leader. Seeing the latter and Boris Johnson in such close proximity was a particularly precious moment. Should The Blond become mayor there may be more. I've some audio, video and more photos which I may post later. Right now, though, my hour of wifi is about to run out. And I need a drink.